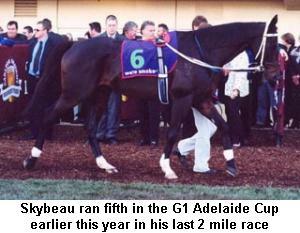 South Australia's favourite racehorse the grand campaigner Skybeau was retired from racing recently. 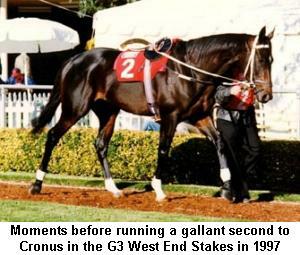 Being a tough stayer he missed out the accolades afforded other members of his foal crop of 1992 but was a clear favourite with the racing public most notably for his five successive runs in the Melbourne Cup. Only a virus in the weeks leading up to the 2001 event prevented him joining Shadow King for the record number of starts in the race of six. Skybeau was sired by Dahar who stood for five years in New Zealand but failed to grab the headlines as a sire despite producing 10 stakeswinners including Group 1 winners Daacha, Stony Bay and Des's Dream. Beaumont Babe was a stakeswinner who won 13 races from 1050m to 1600m but her most well known victory would the Listed Great Western the race that precedes the Melbourne Cup each year. At stud she has produced 10 foals with her first being Bar Dancer in 1987. Bar Dancer raced 45 times for 4 wins and 15 placings ending his career over hurdles. 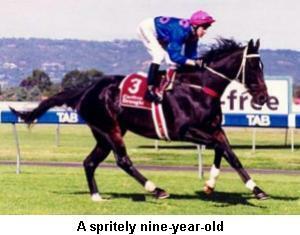 1988 foal Natchez started 39 times for 4 wins and 14 placings before retiring to stud. A filly called Sajama followed before Beaumont Babe was sent to Dahar to produce Bay Tram in 1990. Bay Tram was a consistant stayer recording 7 wins and 7 placings from 37 starts. A second trip to Dahar resulted in Mandoma a duel winner in a short career. In 1992 Beaumont Babe produced Skybeau, a member of Dahar's final local crop, on November 18. After the late foaling Beaumont Babe was not served til the follwing year producing the 1994 filly Classy Babe who won 3 races from 22 starts with 4 placings before heading to stud. A colt called Mr Logic was born in 1995 and another colt called Golden Danabeu now just starting a career in Singapore was born in 1998. Beaumont Babe's latest progeny is a 2yo un-named filly. The 1992 Dahar-Beaumont Babe colt that was to become Skybeau was offered for sale at the New Zealand Premier Yearling Sale in early 1994 by Waikato Stud and was sold for $17,500. He entered the stable of Len Smith at Cheltenham for owners MM Smith, A Grayling, AJ Eastgate, EM Potter and TJ & RJ McLeay. Skybeau was first produced at the early spring barrier trials and finished last of eight behind the talented but ill fated Pittsburgh Phil. Three weeks later he improved to be 4 of 7 behind the speedy Padre but was sent out for a break to mature. In March he was again tried in a barrier trial and was beaten a nose but indicated he was ready to start his racing career. After two unplaced efforts over the 1200m at Victoria Park he was tried over the longer journey of 1400m. Skybeau duly saluted by three quarters of a length over Gildato and was sent for another spell. Another two unplaced efforts began his 3yo campaign but connections saw a future stayer in the gelding and set him for the VRC Derby despite the likely presence of two Sydney colts named Nothin Leica Dane and Octagonal. After running third at Morphettville over 1500m he returned to tackle the 1800m winning easily by 1 ¾ lengths. Two weeks later he stepped up to Listed class to easily beat Willpower and Aimbury in the Hill Smith Stakes at Cheltenham. 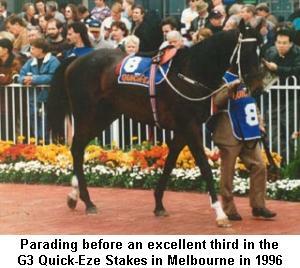 Three weeks later Skybeau found himself at Flemington on the first day of the 1995 Cup Carnival. With all the talk centred around the Cox Plate winning colt Octagonal and his main rival Nothin Leica Dane the South Australian colt was give little hope in the 11 horse field sent out at 40/1. In a race marred by interference which saw Skybeau tightened for room and checked near the 200m Nothin Leica Dane held the late charging Octagonal while Skybeau was finishing hard to take a clear fourth placing. While the winner went on to run second in the Melbourne Cup Skybeau went for a spell with the Adelaide carnival in mind. First up Skybeau won over the 1600m at Victoria Park from Barossa Babe before heading to Melbourne and the Group 2 3yo classics. He ran 6th to Iron Horse in the Autumn Classic before a 5th to Scenic Royale and Saleous in the Alister Clark Stakes before heading to Sydney. After a promising 5th to Peep On The Sly in the Tulloch Stakes Skybeau backed up a week later in the AJC Derby. While Octagonal fought out a memorable race with Saintly and Filante with Nothin Leica Dane in fourth Skybeau crossed the line 11th at only his second attempt at racing in the clockwise direction. Three weeks later Skybeau returned to form in the Rain Lover Plate beaten a half neck by older galloper and track specialist Mr Kildaine. After running 5th in the SA Derby in course record time for the 2500m Skybeau headed to the Adelaide Cup. Sent out at 8/1 the 3yo ran a great race to run second of 19 runners to French Resort beaten only 3/4 length with a further 1 ½ lengths back to Gackwar in third place. After his first attempt over the 3200m Skybeau was sent for a spell to prepare for the Melbourne Cup the following spring. After a first up sixth to another crowd favourite in Hero Wind Skybeau headed to Melbourne and was 6th in the John F Feehan Stakes. He started to strike form as the distances increased and ran second to Toil in the JRA Cup before a third under dark forboding skies in the Quick Eze (Herbert Power) Stakes at Caulfield. Skybeau was unplaced in the Caulfield Cup before a further unplaced effort in the Mackinnon Stakes behind All Our Mob, Filante and Saleous but those runs had topped him off for the target race of the spring the Melbourne Cup. Unwanted in betting Skybeau was sent out at 50/1 while discussion raged over doubts that Cox Plate winner Saintly could run out a strong 3200m and if dour stayers from New Zealand like Count Chivas and Senator would bring about his undoing. As it turned out one of the English horses set a good tempo in front as Saintly settled perfectly along the rails with Skybeau well back. In the straight the race was over with Saintly cruising home from Count Chivas but Skybeau was the eyecatcher as he stormed home from back in the pack to finish third only a neck behind Count Chivas despite racing a touch greenly in the straight. As Saintly headed off on his ill fated mission to Japan Skybeau headed for the spelling paddocks to prepare for another tilt at the Adelaide Cup. It had also become obvious that Skybeau was at his best on dry tracks which continued thoughout his career with all his victories being on good tracks and only 3 placings from 20 attempts on slow rated tracks. He started his autumn campaign in the Tokyo City Cup at Morphettville running 12th on a dead track. Next he was 6th in the TS Carlyon Cup behind Peep On The Sly beaten only a length in a blanket finish. Then to Sydney for the Ranvet Stakes and Mercedes Classic but after only managing to beat one home in both races those races were the last Sydney siders saw of the Skybeau. Freshened up he was unplaced over 1400m before returning to form with a storming victory in the Rain Lover Plate at Victoria Park defeating Dark Ksar by a short head with Top Rating a neck away third. Then the rain struck the Adelaide Carnival. Despite the dead track Skybeau was sent out as the 22/10F for the West End Stakes but couldn't quite match the dash of New Zealander Cronus who won by just over three lengths with a similar margin back to Cockade in third, just ahead of duel Adelaide Cup winner Our Pompeii. The rain continued and the track was rated slow on Adelaide Cup day. Regardless Skybeau was sent out at 25/10 but could only finish fourth beaten 4 ½ lengths behind the lightweights in the race Cronus, Lord Ted and Rover. In the spring Skybeau was again dogged by the wet tracks in Adelaide starting his campaign with 2 unplaced runs before heading to the Naturalism Stakes at Caulfield. The 2000m journey and the dry track was all Skybeau needed to return to his best and won easily from Waterford Road. A fifth placing behind Marble Halls in the Turnbull Stakes followed before being unplaced in the Caulfield Cup behind Might and Power. Though unplaced in the Mackinnon Stakes Skybeau was ready for his second attempt at the Melbourne Cup. Sent out at 16/1 he was never a threat finishing 7th of 22 runners beaten just over 4 lengths in the leader dominated race ultimately won by a millimetre by Might & Power from Doriemus. Kept in training Skybeau lined up in the Sandown Cup 11days later and struck interference near the 800m before crossing the line in fifth place on a slow track behind Star Binder. He then went for a spell but after having a barrier trial in early February a minor problem saw Skybeau miss the rest of the autumn including the Adelaide Cup carnival before returning in the spring for a third attempt at the Cup. Unplaced on a slow then dead track at his two runs in Adelaide it was back to Melbourne. The big wet continued and followed him to Victoria where he was beaten 5 lengths on a dead track in the Turnbull and then 7th on a slow track behind Magneto in the Perrier (Herbert Power) Stks. Next Skybeau tackled the Moonee Valley Gold Cup which was being held on the Thursday night under lights for the first time. On a good track Skybeau showed a return to form in finishing second to Prince Standaan who led all the way to be an upset winner. Plans for the Melbourne Cup were back on track and instead of having run on Derby Day Skybeau went straight into the big race. His racing style of dropping back early and running on always showed that he would need luck in running and as he was moving forward through the field he was checked at the 400m. Though he finished 8th of the 24 runners he was only beaten by just over 4 lengths while conceeding weight to the winner Jezabeel and runner up Champagne who had won the Mackinnon 3 days earlier. Again he pulled up from the run well and was kept in training for the Sandown Cup but again the weather produced a slow track and he ran well back. 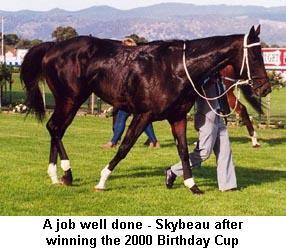 Skybeau returned to follow a similar path to the Adelaide Cup as previous years. Unplaced over the short journey first up he ran on nicely over the 1800m at Cheltenham for 5th. Two weeks later Skybeau was back to his best charging home to win the Group 3 Birthday Cup by two lengths from Archer Street with Kipling about 2 ½ lengths away third. Then he lost all form. Sent out 9/10 F in the Rain Lover Plate Skybeau could only beat one horse home. There was an inquiry into the run, he was examined by the vet and swabbed but nothing conclusive was found and he lined up two weeks later in the West End Stakes. Again he finished well back in 9th of the 15 runners and underwent another vet examination. The problem resolved itself by the Adelaide Cup though. Under threatening skies the cup was run on a good track and Sheer Kingston went to the front in the straight. Suddenly a roar went up from the crowd as Skybeau started to charge on the inside of the leader. For a brief moment it seemed Skybeau would finally get there in a Cup but it was not to be as Sheer Kingston fought back to hold on by just over half a length. Skybeau went for a spell while Sheer Kingston headed to Brisbane where he took out the Group 1 Brisbane Cup. 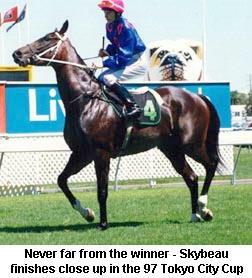 In the spring of 1999 Skybeau just didn't have his usually zest in racing and finished well back in the Lord Mayor Mile (behind the Hayes trained pair Night Sky and Old Tawny), the Naturalism Stakes and the Perrier (Herbert Power) Stakes behind Rogan Josh. Skybeau showed a slight return to form on a dead track in the Moonee Valley Cup behind future Sydney Cup winner Streak, Cronus and Second Coming. His final lead up run was in the Mackinnon where he finished well back but fit and well to run in the Melbourne Cup. Skybeau ran his usual honest race but after being checked at the 600m and 400m, crucial setbacks to the momentum of a backmarker making a long run, he finished 16th of the 24 runners. A five month break from racing and Skybeau returned to his old form. 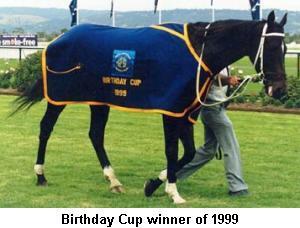 He was unplaced but beaten only four lengths first up before heading to the Birthday Cup. Skybeau looked fantastic in the mounting yard that day and strolled out as if he owned Morphettville. He was sent out at 25/1 and dropped out to the rear as expected. Turning for home he was still well back and forced to go wide to gain a clear run at the leaders. Despite the leaders going strongly inside the final 70m Skybeau was flying home down the centre of the track and was always going to win, defeating Jamestown by a neck. Undergoing renovations including the construction of the new mounting yard in front of the stands the area that was once the front lawns were closed to the public though cheering could be heard from up in the grandstand as the old horse hit the front close to the line. 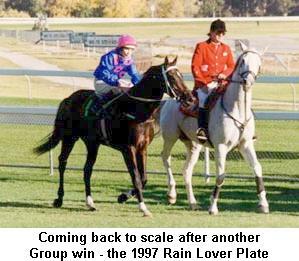 Skybeau was slowly away in the Rain Lover Plate at Victoria Park a week later but on the dead track was a fast finishing third after giving away over 6kg to the winner The Bookmaker two lengths ahead of Odysseus who held second by a nose. With everything going to plan for the Adelaide Cup the weather turned bad and Adelaide experienced its wettest carnival for many years. Skybeau again had problems with the rain affected going when well beaten in the West End Stakes behind Frenzel Rhomb but continued towards the Cup. The weather had improved by Oaks day held on the Wednesday before the Cup and it seemed the weather may just hold. Unfortunately it didn't and on Saturday night the rain started then it poured down all though Sunday and into Monday morning. The Morphettville track was rated as heavy but safe for racing as doubts had been held over the meeting. By race three on the 10 race card the intermittent showers started to cause havoc and the track got worse. After race 7 an inspection of the track deemed it unsafe, the constant rain and four meetings (32 races by this stage) in nine days had taken its toll. The Cup was called off but quickly rescheduled for the following Saturday at Victoria Park. By Saturday Victoria Park was rated as dead and under sunny skies the race took place. Skybeau finished well back with the big wet again denying him his chance to finally win a big two miler and it was off to the paddock. He returned as an 8yo to run first up in the Alcohol Go Easy Cup at Morphettville to claim 5th place. It was then to Melbourne for an unplaced effort in the Naturalism Stakes at Caulfield before heading to Flemington for the Japan Trophy. Despite the humid and overcast conditions the track was dry and Skybeau looked well. Coming to the turn he was well back and was pulled very wide to make his long searching run. Well into the straight Skybeau still looked a chance but couldn't quite pull enough ground off Brew who got there by a long neck from ill fated NZer The Warrior with Skybeau ¾ of a length back in third. The wet weather returned for the Melbourne carnival and Skybeau was unplaced in both the Herbert Power Hcp and the Geelong Cup where he tailed off last but no problem could be found. On a slow track he was unplaced behind Brew in the SAAB Quality three days before the Cup but the weather improved for the big day. Skybeau was given little chance of victory in the Melbourne Cup sent out at 160/1 though with race fans he was the sentimental favourite. Dropping back to the tailenders early he was given the perfect run. Gradually making ground from the 2000m Skybeau was poised to strike in company with Yippyio around the turn, with both wide but running on. By the 200m Second Coming was in front and kicking strongly as Yippyio, Skybeau and the bottomweight Brew started to power home. A slight scrimmage between Skybeau, Yippyio and a tiring runner knocked the momentum out of Skybeau's run as Yippyio got clear to chase Second Coming. Brew ended up finishing the strongest of all to race away in the end and win by 2 lengths from Yippyio with Second Coming holding third as Skybeau passed the post 9th but should have finished closer. 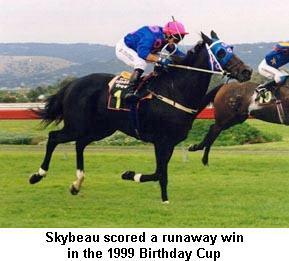 After a break Skybeau returned to win a barrier trial before being unplaced in bunched finish in the Birthday Cup. A 6th in the Rain Lover Plate followed before he ran second in the Carlton (West End) Stakes after hitting the front at the 200m and just being run down by Apache King. 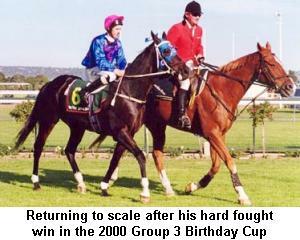 His short campaign ended with the Adelaide Cup. Looking to have a far better chance than in 2000 the race itself brought about his defeat. A very slowly run race with a sprint home make it impossible for the backmarkers to have a hope but Skybeau tried his heart out. Native Jazz led to the 800m but lost the front as several runners made early moves. In the straight Apache King was in front with Native Jazz trying to make ground along the rail with Bel Air chasing from Skybeau and Frenzel Rhomb. On the line Apache King was a half length in front from Native Jazz with another 2 ¼ lengths to Bel Air third just ahead of Frenzel Rhomb and Skybeau. The 3200m was covered in 3.29.70 with the final 600m in 36.77 on a dead track. Skybeau returned to training for his 9yo season with his spring aim the Melbourne Cup where he would have equalled the record for the most starts in the race. First up he was unplaced in the Balaklava Cup where almost the entire field of 15 crossed the line within 6 lengths of the winner. Then under 61.5kg he made a farewell appearance in South Australia at Victoria Park finishing unplaced behind Ama Star. After another unplaced run at Flemington Skybeau finished only four lengths from the winner in the Winning Edge (Herbert Power) Stakes a leader dominated race won by Freemason. 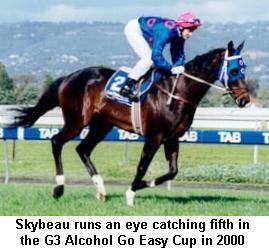 Skybeau was then entered in both the Geelong Cup and Moonee Valley Cup but was saved for the latter. On raceday morning he was amongst the scratchings and his Cup campaign was over. He had contracted a virus and headed home. It was announced that the Port Cup may be a new goal but last week it was decided to retire Skybeau bringing to an end the career of South Australia's best but unluckiest stayer of the era. Skybeau started in the five Melbourne Cups and five Adelaide Cups and always ran well and with any luck would have recorded victory not just placings over the 3200m. Connections believe Skybeau would make a nice horse for equestrian sports rather than just retiring to a paddock and if and when he takes up his new career it will be followed with interest.